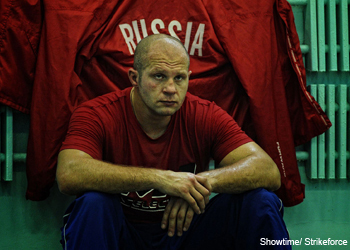 Although Fedor Emelianenko’s illustrious mixed martial arts career appears to be winding down, the 34-year-old will make his silver screen debut in “The Salamander Key” (formerly The Fifth Execution) this week in Moscow, Russia. Alongside “The Last Emperor,” the motion picture also stars Rutger Hauer and Michael Madsen. The movie is premised on a group of international scientists who disappear on a remote island in South-Eastern Asia. While conducting advanced medical research, the Rescue Group commissioned to seek out the team locate remnants of a high-tech laboratory revealing evidence that experimental testing has been conducted on animals and humans. The last communication from the scientists prior to their disappearance cautions the world of immanent, grave global disaster.